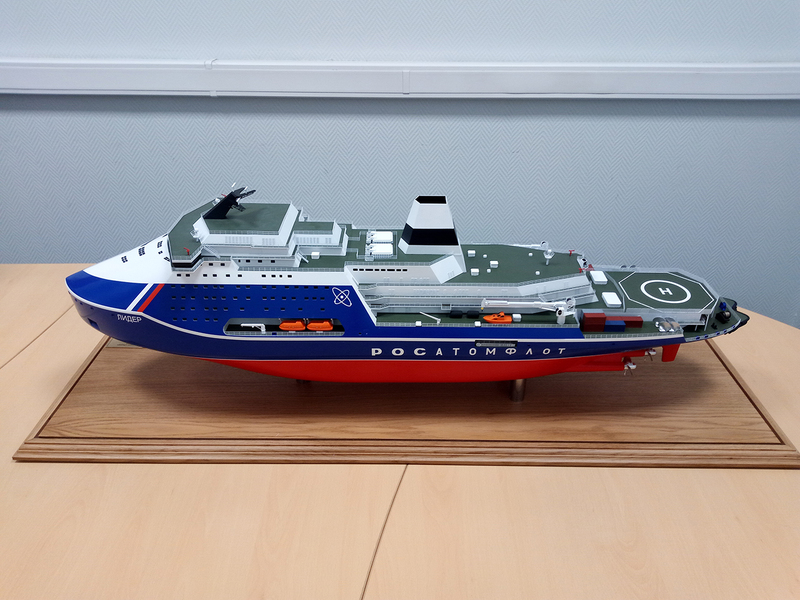 Design and engineering documentation (initial draft) for nuclear-powered icebreaker of project 10510, Leader, ordered by “Zvezda” Shipbuilding Complex LLC ( Bolshoy Kamen, Primorsky Territory) will be developed by “Iceberg” Central Design Bureau (Saint-Petersburg). According to the Unified Information System for Procurement, initial (maximum) price of the contract is RUB 3,134,442,219.12. Procurement method – Procurement from a sole provider (contractor). Icebreaker of project 10510, Leader, is intended for year-round escorting large single ships and convoys of ships (over 100,000 tonnes in deadweight and over 50 meters in width) along the Northern Sea Route with a commercial speed of 15 knots through ice of about 2 meters thick. Key characteristics of the icebreaker: displacement – about 71,380 t; length - 209 m; width – 47.7 m; draft – 13.0 m; reactor plant – two RITM-400 reactors of 315 MW heat rate each; propulsion power - 120 MW; cruising range – unlimited; endurance – 8 months; icebreaking capability: – 4.3 m at a speed of 2 knots and 2.0 m at a speed of 15 knots; width of canal – about 50 m.
The competition on the development of permissive documentation was won by “Iceberg” Central Design Bureau, contract price – RUB 380 million. The work is divided into three phases with the first one to be concluded by 20 December 2018, the second – by 31 July 2019, the third – by 29 November 2019. “Zvezda” Shipbuilding Complex was selected to implement the contract on construction of the Leader icebreaker by the decision of RF Government.